Following on from our news item earlier on today, which reported on the arrest of a Weymouth teenager for sending malicious tweets to Team GB diver Tom Daley, it has been confirmed that the teenager in question has been released with a harassment warning from the Police following the incident. The incident, which sparked anger on the popular social networking website Twitter, took place yesterday afternoon, after Tom Daley had finished 4th in the synchronised diving event. The Police issued a brief statement that the teenager was released on bail after being given the warning “pending further investigation”. It is believed that the Police want to look into other communications sent by Rileyy_69 via his Twitter account, however the nature of the other tweets being investigated and who they were directed at is not currently known. The 17 year old boy from Weymouth sent a tweet to Daley saying “You let your dad down i hope you know that.” to which Daley responded “After giving it my all…you get idiot’s sending me this…”. Not conforming with generally accepted standards of behavior or propriety; obscene. it could be seen to come under section 1 b) of the Malicious Communications Act 1988 (in our completely non-legal point of view!). Tom Daley has made no further comment on the matter on his Twitter account. A 17 year old teenager, from Weymouth, has been arrested today after sending offensive tweets to Olympic diver Tom Daley yesterday. After finishing 4th yesterday in the synchronised diving event, Tom Daley (@TomDaley1994) received a tweet from another user @Rileyy_69 sent a tweet to the Olympic diver saying “you let your dad down i hope you know that”. Daley’s father died last year after a battle with cancer. Tom Daley responded with a tweet on his own profile saying “After giving it my all…you get idiot’s sending me this…RT”. Prior to the Olympics, Daley has spoken fondly of his father and stated that he “gave me all the inspiration that I’ve needed”. The response on Twitter was of disgust towards the user known as Rileyy_69 with messages of support for Daley being sent from other Twitter users. This is the latest of a number of arrests made by Police with regards to harassment and offensive messages on the social networking site, with a man previously being arrested for sending threats to Tory MP Louise Mensch. Several news sources are stating that Rileyy_69’s account has been suspended by the social networking site, however the account appears to be fully accessible now, albeit with the profile set to ‘private’ so only current followers can see his full profile. This news story again highlights the fact that the Police are taking ‘social networking crime’ seriously and that statements, harassment and abuse using social networks can have serious consequences. Many Internet users still believe that a lot of their activity online is anonymous but the latest string of social networking arrests proves how easy it can be for users to be traced by computing professionals if necessary. PayPal is one of the word leaders in online payments, both making and receiving payments. Receiving payments online can sometimes be a costly process with more traditional payment processors like banks and credit card companies. However, companies such as PayPal have gained a very positive reputation among businesses and consumers alike. When registering for a PayPal account, a business is not asked to provide many details and few security checks are performed prior to opening the account. This has both advantages and disadvantages. An advantage for businesses is that it is a quick and simple process to set up a PayPal Business account and start accepting payments within 10-15 minutes thanks to PayPal’s instant account activation. However, a disadvantage for consumers is that with little security checks being performed initially, how can they be sure that the money they are sending is going to the right person and if the business is legitimate? Well, this is the reason why PayPal for a long time have had an account verification procedure. Businesses can choose to verify their accounts by agreeing to provide more detailed information and undergo advanced security checks. These checks ensure that the businesses has been identified as a legitimate business, is trading from the address(es) that it states, and has a verified business bank account with a recognised bank. All these checks ensure that the customer is dealing with who they think they are and that they are running a legitimate business operation. So, bearing this in mind, getting your PayPal Business account verified is essential. And for legitimate businesses, there is absolutely no reason why not to follow and complete the simple verification process. It benefits the business by instilling consumer confidence in the PayPal payment thus likely resulting in increased sales and it also benefits the consumer by letting them know that the business has passed advanced verification and security checks. As previously mentioned, PayPal is one of the largest and most respected payment processors for both businesses and individuals. PayPal is one of the payment methods that DPS Computing Limited accept through it’s customer area and for all of its products and services. And of course, we have verified our account so that you can be assured that your payments to DPS Computing are both secure and authenticated – leading to a completely safe online shopping experience! We’re sure that if you’ve ever searched for web hosting you will have been bombarded with offers and advertisements declaring ‘100% uptime’, ‘100% uptime guarantee’ or ‘100% uptime SLA’ (Service Level Agreement). So, is it possible? Well there’s no easy way to answer this – it truly is both yes and no. Yes, it is possible to achieve 100% uptime over a specific period of time. However…. No, it is not possible to be truthful and offer any form of guarantee or service level agreement with a 100% uptime rating. Why is this? Well, there isn’t a single web host in existence that has had 100% uptime for their customers servers. Not one. And if they try to tell you that they have, they’re simply being dishonest. Yes, it might sound like a great sales pitch, but seeing ‘100% uptime’ should make you very skeptical about the rest of the things that the company is claiming for their web hosting. For the reason that it is impossible to offer an 100% uptime guarantee or SLA, you will not find any such claims or references on any of DPS Computing’s web hosting packages. We believe wholeheartedly in honesty and transparency with our customers. Does the mean to say that 100% uptime is impossible? No, of course not. While 100% uptime cannot be guaranteed by anyone, good hosts do have (sometimes long) periods of 100% uptime on their customer servers. For example, DPS Computing’s web hosting customer servers have had 100% uptime for the previous 12 days and 100% uptime is most definitely something for any good web host to aspire to. So, why do some web hosts claim 100% uptime? Well you’ll no doubt see many web hosts (including big web hosting companies) offering 100% uptime guarantees. Quite simply it’s a marketing ploy. It is not possible – and is extremely unlikely (dare we say impossible!) that this will be possible for many many decades. Everyone likes the idea of 100% uptime and it sounds good, so some web hosting companies advertise this in an effort to gain more customers. However, it does make you wonder, if a web host makes an impossible claim about their uptime, what other things are they misrepresenting? You’ll usually find that you will have a much better experience (and in most cases, more uptime) with a web host that is being honest about what they can realistically offer you for an uptime percentage / uptime service level agreement (SLA). If you want an honest host, with great features, excellent technical support knowledge and value for money prices, make sure you check out our web hosting packages – we’ve got packages suitable for all types of website, both individual and business websites. Plus, if you’d like to configure you’re own package, contact us with your requirements and we can give you a free, no obligation quote for your exact requirements – ensuring that you only pay for what you need. Sometimes its necessary to clear the cache and sometimes its just helpful and can help speed things up – especially if you don’t clear the cache often. There are several possible reasons for wanting to clear the cache. Maybe you’re running out of disk space (or want to free up some more)? Maybe you’re web browser is going really slowly? Or maybe you’re seeing an old version of a web page that you know has been updated? The final one affects web developers a lot of the time! 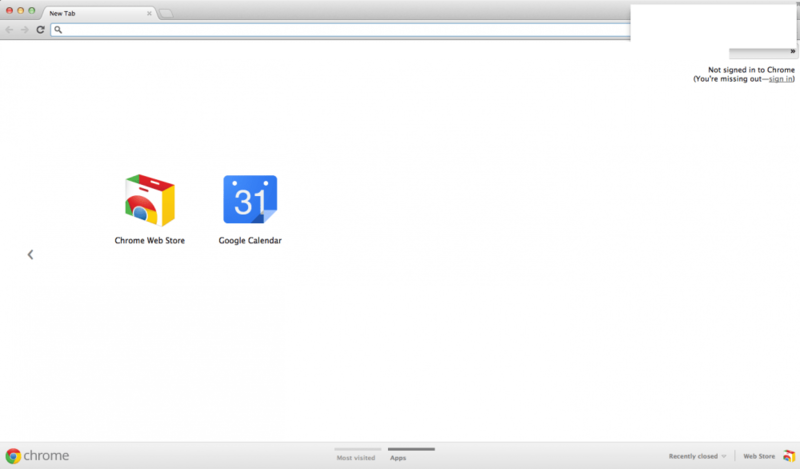 In this tutorial we’re going to go through some simple steps to clear the cache in Google Chrome. Google Chrome has become a very popular browser, with one of its key advantages being its speed. In a time when some browsers continue to get ever-more bloated and take up even more memory (that’s RAM, not hard disk space ;)) its a refreshing change to have a browser with a smaller memory footprint and speeder response times. However, no browser can escape the slow down of an unnecessarily large cache. A cache is a temporary place where website files are stored on your local computer so that next time you visit that website, it can load faster (as it doesn’t have to download some or sometimes all of the files for that website page). However, after a while, this cache can be rather large, and that not only takes up disk space but it can make your browser very sluggish, which in turn leads to your frustration. 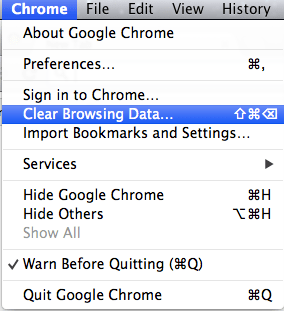 There’s a few simple steps to clear the cache in Google Chrome listed below. And don’t worry, nothing bad can happen to your computer by clearing the cache. The worst that can happen is that some websites are a little slower to load than usual at the beginning (due to all the files for the website having to be downloaded) but this is becoming an extremely small problem, and most of the time unnoticeable, due to fast broadband connections available these days. 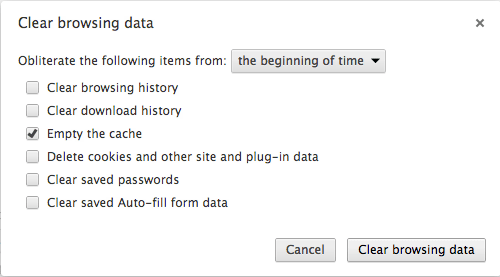 As we want to clear the entire cache, select ‘the beginning of time’ from the drop down box near the top of the dialog. This will ensure that all the cache is deleted. Also ensure that the ‘Empty the cache’ checkbox is ticked. It is only necessary to tick this one checkbox to delete all of the cache, but feel free to tick the other boxes if you want to delete any other history / cookies etc. The cache is however, the one which will have the most impact on the performance of your browser. 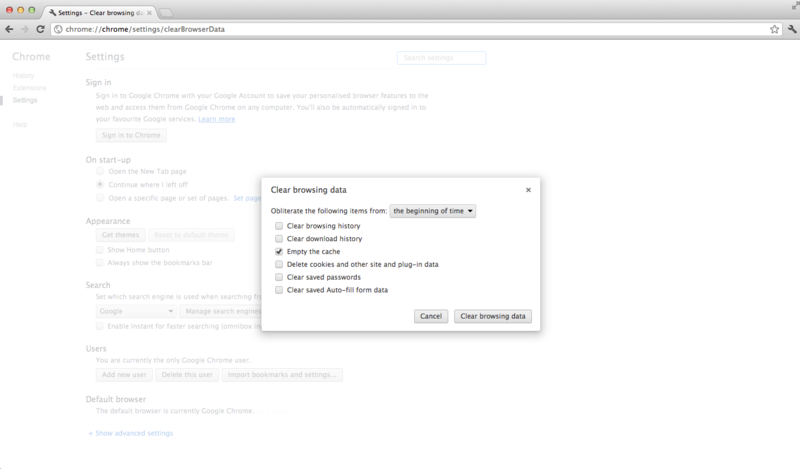 After you’ve selected the settings described above and shown in the above picture, click on the ‘Clear browsing data’ button. Please note that clearing the cache make take a while, depending on how often you use the browser and how long it is since you last cleared the cache. And that’s it! You’ve cleared Chromes cache and you should now be experiencing increased performance while browsing! :).